Landscape Design in Alberta, Canada, North America – by W Architecture and Landscape Architecture with Civitas, Inc. The ‘Living Island’ provides a natural landscape infrastructure, creating both a well-located community resource and increased ecological diversity. This meant configuring new topographies to allow the water to again interact with the island in the form of two new but different channels—a stream and a wetland. These features expand the available habitat and generate a sense of place, nurture strong spiritual attachments to the island’s beauty, seek balance and harmony between constructed and natural elements, and provide opportunities for life-enriching experiences. 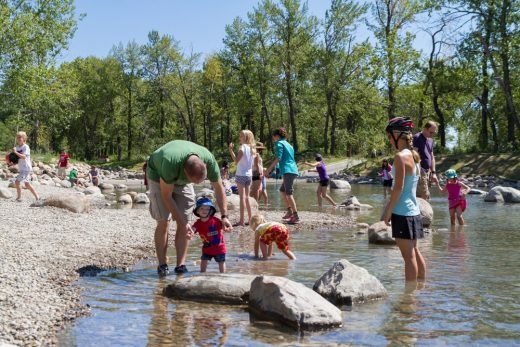 New amenities, including the beach and stream, a no-impact boardwalk and pedestrian passages and plazas, connect visitors with the natural dynamic processes of the river. The center of the island was restored as a bio-diverse and tranquil area of natural habitat centered on the new wetland and adjacent existing mature forest. 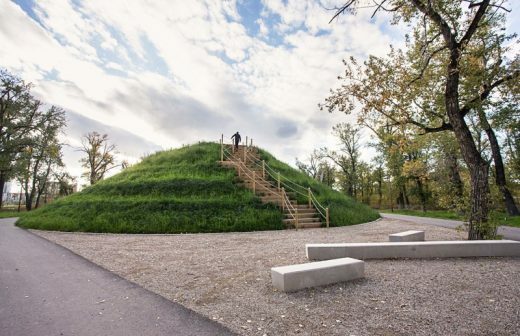 The Rise is built from the excavated soil on a former lawn area and provides a slope for large gathering, a place to view the city, and sledding in the winter. The hardscapes are built consistently in the park with an integrated system of materials including stainless steel, concrete pavers and local laminated timbers. By allowing the 30-acre park to interact with the seasonal flow of the river, new ecologies were opened to human exploration and a more diverse habitat was created for animals. 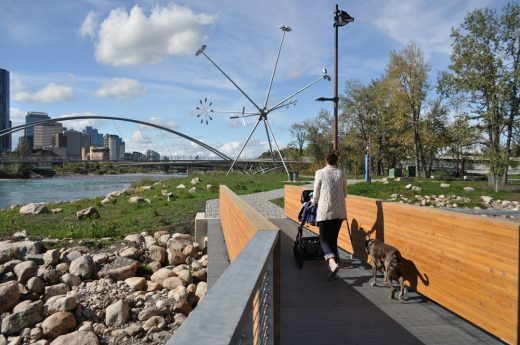 Shared experiences link along a multi-use pathway traversing the island, connecting into Downtown Calgary and adjacent urban centers, creating unique place-making amenities with long-term resilience to the inevitable flooding of the Bow River. 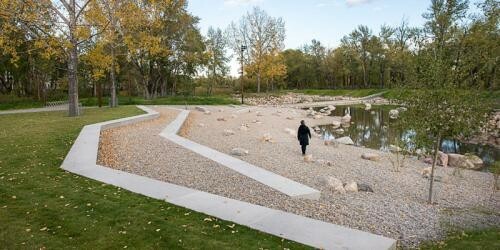 Landscape Architects: W Architecture and Landscape Architecture with Civitas, Inc.
General Contractor: Marmot Construction Ltd.
(Calgary, Alberta) – The Calgary Municipal Land Corporation (CMLC) is hoping pictures speak a thousand words in an innovative new survey launched today. The on-line ‘visual preferences survey’ is an illustrative summary of public input to date on suggested uses for St. Patrick’s Island. The new survey asks Calgarians to respond to a series of pictures that represent different options for the rejuvenation of the island. 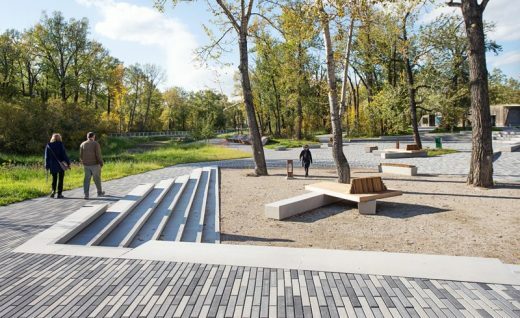 “Just as we looked to Calgarians for feedback on the new RiverWalk and the St. Patrick’s Island bridge design, we’re now soliciting ideas for the rejuvenation of St. Patrick’s Island,” said Susan Veres, Senior Manager, Communications and Marketing, CMLC. Calgarians will be encouraged to submit their ideas and concepts through a survey available on the CMLC website. (Calgary, Alberta) – And then there were three. The Calgary Municipal Land Corporation (CMLC) and its 10 member advisory committee today announced the three concept submissions selected to move forward to the next stage of the competition for the new St. Patrick’s Island pedestrian bridge in East Village. 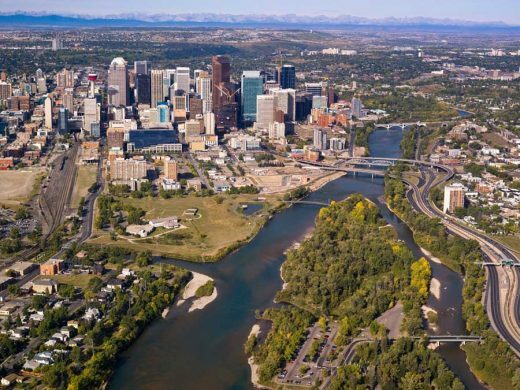 The Calgary Municipal Land Corporation (CMLC) today launched another exciting step in the ongoing rejuvenation of the Rivers District, which includes East Village, with the opening of the St. Patrick’s Island Bridge conceptual design competition.